Vermont environmentalists are ramping up their opposition to a proposed natural gas pipeline that, if approved, would extend Vermont Gas’s service south into Addison County. 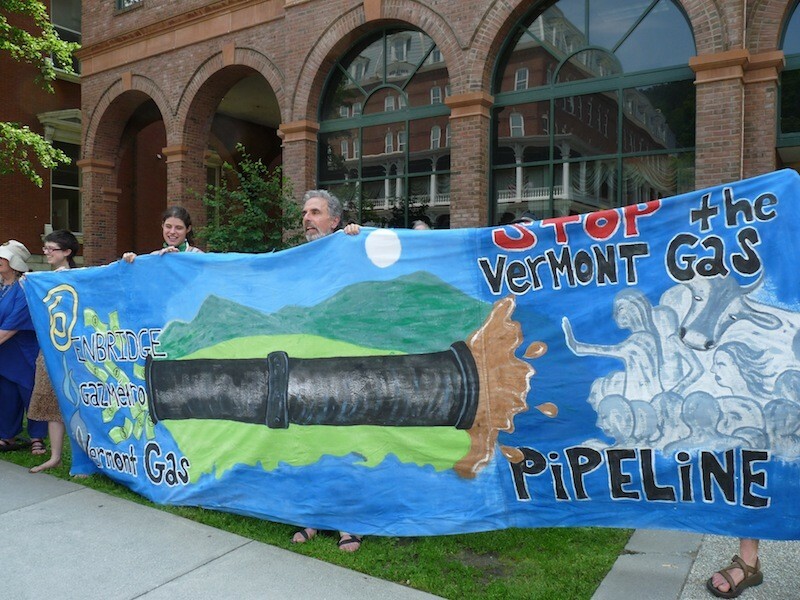 A group of 20 to 30 protesters took to the halls of the Department of Public Service yesterday, asking the DPS to reconsider its support of the project and complaining that the process for approving the pipeline — overseen by the Public Service Board — is neither transparent nor inclusive for Vermont citizens. The activists demanded that the PSB take more public input before moving forward in the permitting process, and also asked that the board consider the toll of the project for communities on both ends of the pipeline. (Some portion of the natural gas slated to move through the pipes would come from fracked gas fields in Alberta, Canada.) They called for a full "cradle-to-grave" greenhouse gas emissions analysis of the project, and questioned the DPS's assertion that natural gas will maintain a significant price advantage over other types of fuels for years to come. "What we want much more than a meeting … is for them to create avenues for real public participation in this process," said Will Bennington, an organizer with Rising Tide Vermont, in a brief phone interview with Seven Days yesterday afternoon. "If [the DPS is] supposed to be representing the people of Vermont in the proceeding, they need to do a much better job of soliciting input from people." Members of Rising Tide Vermont, looking to participate in the PSB permitting process, formed an ad hoc group called Vermont Intergenerational Stewards, but the PSB denied the group intervener status in the proceedings. The earliest opposition to the Vermont Gas project came primarily from landowners, who balked at the construction of a large transmission pipeline — which would not serve many of the individual homeowners along the route — in their literal and figurative backyards. But adding to the health and safety concerns raised by many of these neighbors is a chorus of objections from environmentalists, who insist that Vermont shouldn't be investing in more fossil fuel infrastructure and who question the merit of bringing “fracked” gas into a state that last year banned the controversial method of hydraulic fracturing as a method for extracting natural gas. An analysis issued earlier this month by the Conservation Law Foundation suggests that the Vermont Gas expansion would actually increase greenhouse gas emissions, rather than decrease them, as Vermont Gas has routinely maintained. The PSB is currently considering the first of two proposed phases of the pipeline extension; Phase One would extend natural gas service south to Middlebury. A second phase would carry gas under Lake Champlain to the International Paper plant in Ticonderoga, N.Y. Both phases require a Certificate of Public Good in order to move forward. Photo courtesy Will Bennington, Rising Tide Vermont.